The Andy Hardy series comprised sixteen motion pictures, made by Metro-Goldwyn-Mayer Studios from 1937 through 1947 (with one reunion film made in 1958). 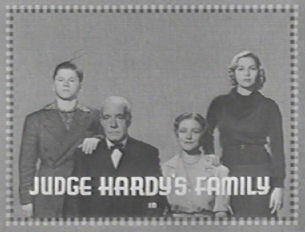 The fifteen films in the series proper concerned a fictional small-town judge (Lionel Barrymore, Lewis Stone), his wife (Spring Byington, Fay Holden), her unmarried sister (Sara Haden), his daughters (Cecilia Parker and Julie Haydon), and last but not least, the judge's son (Mickey Rooney), who was the title character in the series. The first film, A Family Affair, was adapted from a Broadway play titled Skidding by the playwright Aurania Rouverol. MGM Studios probably had no notion of making any more films than the one. But the fan mail convinced the executives to revisit the question—probably on the strength of Mickey Rooney's reputation as an actor more than on any other factor. Lionel Barrymore, after making A Family Affair, suffered the accident that would limit him to playing handicapped men for the rest of his career. Lewis Stone took over as the Judge and played that role through the rest of the series proper. The studio also re-cast the roles of the judge's wife Emily and of Andy's regular girlfriend, Polly Benedict. Other than that, and except for the occasional setting away from Carvel, the studios incurred very little expense and could make film after film on relatively low budgets. George B. Seitz directed nearly all of the films—except that W. S. Van Dyke directed the seventh (Andy Hardy Gets Spring Fever), and Howard W. Koch directed the reunion film (Andy Hardy Comes Home). Most of the stories took place in the judge's home town of Carvel, Idaho. However, many of the stories followed the Hardy family either to vacations or to special assignments or other adventures in Catalina, California; Washington, DC, New York City, a ranch in Arizona, and Detroit, Michigan. In addition, two of the films chronicled Andy Hardy's adventures as a college student in yet another unnamed community. The town of Carvel is fictitious, as is everything connected with it, including Judge James K. Hardy and his family, and the story arc, such as it was (see below), that the films depicted. As depicted in these films, Carvel had a population of 25,000—large enough to have its own public school system and regularly to elect its own judge, but not much larger. Carvel had its own railroad station, apparently with excellent railway connections to Washington, DC and to New York City. Carvel also had its own airfield, which figured in only two of the films. Judge James K. Hardy (Lionel Barrymore in the first film, and Lewis Stone in the fourteen succeeding films). Emily's sister Millicent Forester or "Aunt Milly" (Sara Haden)--who also is Andy's English teacher in high school. Andy Hardy, the judge's son (Mickey Rooney). Kay Wilson (Bonita Granville), a fellow student at Wainwright College and a member of the first freshman class at that college to admit women. Oddly enough, he did not marry any of these three. In fact, he would return from World War II to find Kay betrothed to another man. Francis Bacon "Beezy" Anderson (George Breakston throughout most of the series, and Joey Forman in the reunion film), a pal of Andy's. He and Andy always seem to land in trouble, with Andy in worse trouble, usually financial, as a result of some blunder that Andy and Beezy have committed. Jeff Willis (William Lundigan), who must do some growing-up himself (primarily by learning to refrain from driving under the influence of alcoholic drinks) before becoming a worthy suitor to Andy's sister Marion. The Andy Hardy series featured many women who would go on to number among Hollywood's most prominent leading ladies. These included Lana Turner, Kathryn Grayson, Donna Reed, Esther Williams, Bonita Granville, and, of course, Judy Garland. In fact, "Andy Hardy's latest crush" was one of the attractions of the successive installments in the series. At least one other prominent actor, Herbert Marshall, appeared in two of the films as the president of the college where Andy enrolled. The major story arc that spans the first fifteen films is the maturing of Andy Hardy, from a callow, womanizing youth to a much wiser young adult. He learns responsibility the hard way—a way perhaps made harder because the judge, even were he so inclined, literally cannot afford to indulge half the demands that Andy frequently makes for money. In one story, however (The Hardys Ride High), Andy gets a taste of wealth when his father receives word that he might be heir to the fortune left by a dead automobile magnate—and learns that money definitely cannot buy happiness and often can land a young man into the sort of trouble of which he had scarcely dreamed. Andy learns a lot of life lessons along the way, mostly having to do with love and lust (and the difference between the two). In one film (Andy Hardy Gets Spring Fever), he develops a schoolboy crush on one of his teachers; in another (Love Finds Andy Hardy), he is asked, as a favor to a friend, to keep the friend's rather vampish girlfriend (Lana Turner) company. Eventually Andy goes to college (with a four-year interruption occasioned by his conscription into the United States Army). On his way he meets his last girlfriend (Bonita Granville), whom he eventually loses after he returns from fighting in World War II. Upon graduation he becomes a lawyer and moves away to California, where he meets his eventual wife Jane Patricia Breslin. In the reunion film, he, Jane, and his son Andy Hardy, Junior (Teddy Rooney) return to Carvel, where Andy first tries to negotiate a major land purchase and eventually becomes Carvel's new Judge Hardy. Judge James Hardy himself had several story arcs, most of which revolved around his work as a judge. In the first film, he clashes with a shady water-project builder who tries to influence the judge's rulings by planting false scandals about the judge's married daughter in the town newspaper and even fomenting a movement to remove the judge from the bench. Having survived that fiasco, the judge almost loses his home after the vindictive, frustrated, and conniving aqueduct builder induces him to make a major mistake in co-signing a note shortly before the property for the failed water project goes into foreclosure. The judge survives that, too, and on the strength of his experience with the water project he receives an appointment to a utilities commission in Washington—where unscrupulous politicians also try to influence the judge by coaxing information from the judge's younger daughter, Marion. Through it all, the judge refuses to be manipulated and bases all his rulings on the letter of the law and a proper determination of equity. His reputation for integrity well-established, the judge soon travels to Arizona to help a friend who is threatened with the loss of water rights—and discovers that the other party is benefiting from the earlier diversion of a river and must, by law, restore the river to its original course. Soon afterward, the judge receives word that he might be entitled to a multimillion-dollar legacy—but then turns up evidence, to which he alone has access, that he is not so entitled. In perhaps the most poignant demonstration of personal integrity that the series offers, the judge presents the evidence and declines the legacy—and learns in the process that the testator's conniving relatives had thought to entrap him. Beginning with the seventh film, the judge had no continuing story arcs. From then on, any case that he handled in the course of the series was decided at the end and had no lasting repercussion. Judge Hardy did not appear in the reunion film; according to the story line, he had died while his son was out in California, and his judgeship had passed to one successor and then fallen vacant when Andy returned to Carvel. The first film set the tone for the rest of the series. Its themes were honor, integrity, courage in the face of scandal, and maturity. Occasionally the films would teach other valuable lessons, including patriotism. In Judge Hardy's Children, for example, Judge Hardy takes his son on a trip to Mount Vernon and gives him a stern lecture on the troubles facing George Washington as General of the Continental Army and as the first President of the United States. Judge Hardy also, on more than one occasion, delivers sharp tongue-lashings to defendants in his court whose offenses against integrity offend him even more than do their particular violations of the law. More important than these were the life lessons for growing boys. Andy Hardy remained wildly popular because boys of the period could identify with his social, money, and girl troubles. Nor were all the films totally comical: in one, Life Begins for Andy Hardy, Andy Hardy learns some of the hardest lessons of his life when a good friend of his suffers a heart attack and dies. On August 15, 1941, the mayor of Hollywood held a ceremony at Mann's Chinese Theater (known as Grauman's Chinese Theater at the time) in which he presented a plaque to the principal actors in the series and dubbed Judge Hardy's family "the first family of Hollywood." That plaque cannot be found today. In 1943, the series received a special Academy Award for its "achievement in portraying the American way of life." Andy Hardy's Dilemma (1938), a twenty-minute short subject actually intended as a public-service announcement in support of the Community Chest charities. ↑ 1.0 1.1 Johnson, Jim. Andy Hardy Fan Site Home Page. Accessed December 21, 2007. ↑ Johnson, Jim. "Andy's Girls." Andy Hardy Fan Site. Accessed December 21, 2007.